As part of the generous Faculty Career Enhancement Grant we received from the Associated Colleges of the Midwest (ACM) to get our makerspace up and running, we also had funding to host a 3D printing workshop for interested participants from fellow ACM schools. 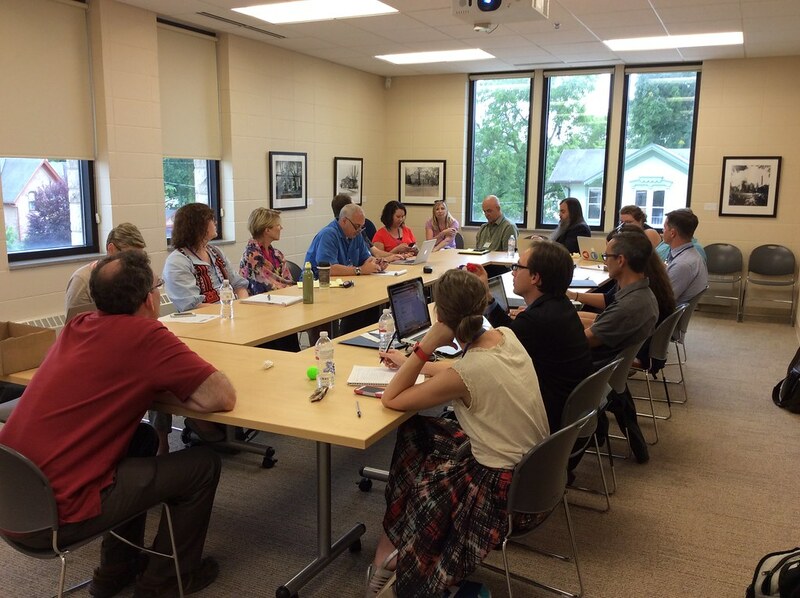 This workshop took place on the Lawrence University campus on August 4-5, 2016. Bryan Alexander discusses 3D printing in liberal arts education. The purpose of this workshop was to introduce 3D printing pedagogy to educators who may be interested in integrating it into their teaching and work. 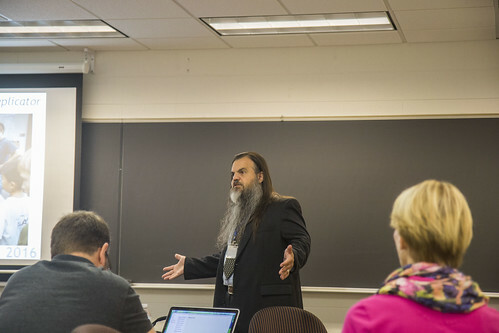 The workshop began with an informative and engaging presentation by Bryan Alexander, entitled, “3d Printing Across the Curriculum: From Liberal Education to the Replicator” (slides available in Lux or see the recording.) Other activities included a discussion of experiences with pedagogical applications of 3D printing, as well as hands-on design time to become acclimated to the technologies of 3D printing. The entire schedule is available at the workshop page. Participants discuss pedagogical applications of 3D printing. Participants came from eight different schools and a wide range of academic disciplines. Areas represented included, museum studies, education, art, English, chemistry, library, music, theatre, administration, and more! While the participants had differing academic backgrounds, there were many overlapping interests and concerns that led to some very enriching discussions. Participants get hands-on experience with 3D modeling. Photos from the event can be found in our workshop Flickr album. Some workshop highlights and more photos can be found at #ACMMAkers16 on Twitter. 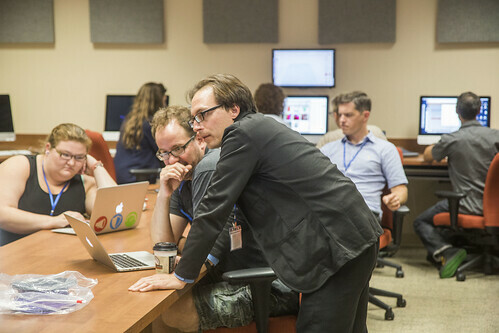 This workshop was a wonderful opportunity for educators to come together to share knowledge, to become comfortable with exciting technologies, and to make some new connections. Those of us who planned the conference are grateful to everyone involved for making it such a great experience! 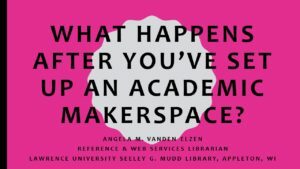 This entry was posted in 3D Printing, ACM, Conferences, Guest speaker and tagged academic library makerspace on August 29, 2016 by Angela Vanden Elzen. 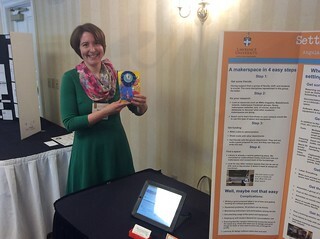 The LU makerspace poster won best visual display! We recently presented at the Wisconsin Association of Academic Librarians (WAAL) conference poster session. 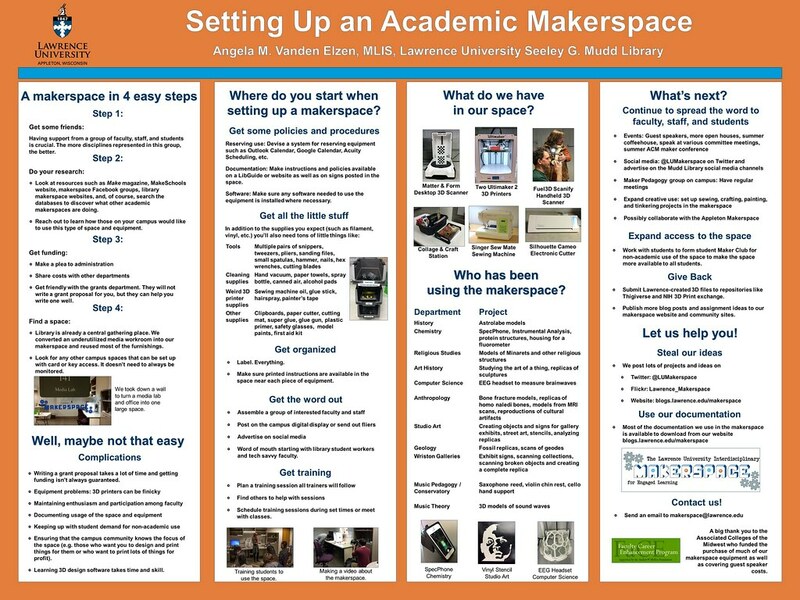 Our poster outlined some of the important considerations to follow when setting up an academic makerspace, along with some of the things we’ve learned while doing so. See more photos, including a larger version of our poster, in our Flickr album. Links to other posters and presentations from the conference are available on the Wisconsin Library Association website. This entry was posted in 3D Printing, Conferences on May 4, 2016 by Angela Vanden Elzen.